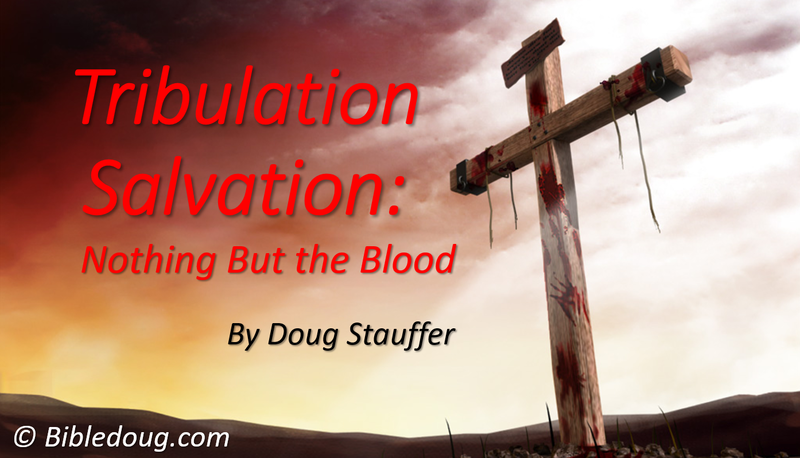 Follow the exploits of Dr. Douglas D. Stauffer as he explores the wonders of the world while exalting the Saviour! Tribulation Salvation: who cares? Since the Church will be raptured out prior to the commencement of any part of Daniel’s Seventieth Week, some of the brethren consider the topic of Tribulation Salvation irrelevant. They question why anyone would expend any time and energy to discuss a topic that only applies after the Church is gone. On the surface, that philosophy sounds prudent, but unfortunately it is seriously flawed. The answer is quite simple: much pen and ink has been used covering the topic of Tribulation Salvation. With all the information and misinformation, the current teachings will impact those remaining on earth after the Rapture—whether the teaching is right or wrong. Preachers and teachers have a grave responsibility to ensure that their teachings on this subject are right, not for our sakes, but for the sake of those influenced by our teachings after the Rapture. Incorrect teachings and perversions of the gospel will condemn those hearing our message after we are gone. So, it is unwise to dismiss this subject as irrelevant rantings, unless you deem souls in the future less important than souls today. The first point that must be recognized and understood concerns those who will and those who will not take the Mark of the Beast. Bible nuggets of truth remain buried until harvested with the help of God. For instance, wrapped within the narrative of Christ’s return to earth at the Second Advent (Revelation 19:11) is an interesting facet concerning those that take the Mark of the Beast. This truth has been overlooked by the commentators and Bible pundits but offers insights into the specifics of who can and cannot take the Mark of the Beast and subsequently worship his image. Take notice of the group that is subject to the blasphemous idolatry. This single passage points out that no one is forced into taking the Mark. Those who take the Mark are deceived into receiving the Mark and deceived into worshipping the image of the Beast. Thus, those who take the Mark willingly do so and willingly worship the beast. More importantly, the passage explains why they take the Mark—they are deceived into doing so. This point cannot be overemphasized—only the DECEIVED are going to take the Mark and worship the Beast. Likely, this is why Jesus repeatedly warned during his Olivet discourse concerning the heightened time of deception during Daniel’s Seventieth Week (the Tribulation period). Christ’s warning: Don’t be deceived; many (including false prophets) will deceive many. His repeated warnings against being deceived are not by accident or coincidental. Matthew 24:5 For many shall come in my name, saying, I am Christ; and shall deceive many. Matthew 24:11 And many false prophets shall rise, and shall deceive many. It is vitally important to take notice of these warnings since Jesus also said that there is a specific group during that time that CANNOT BE DECEIVED because of God’s supernatural protection and provision (addressed later). The point is that deception is the key to acceptance of the Mark. Those rendered impervious to deception are invulnerable to taking the Mark. Who are those impervious to deception? Those saved by the blood! Interestingly, another point often overlooked by the pundits of scripture concerns what the Bible says about how someone gets saved during the Tribulation. Revelation says that the overcomers (the brethren—verse 10) are those who have trusted in the shed blood of Christ on the cross of Calvary. Revelation 12:11 And they [the brethren] overcame him by the blood of the Lamb, and by the word of their testimony; and they loved not their lives unto the death. Salvation is by the blood! The blood! The blood! Salvation is all about what Jesus has done and not about what man can do. The soul’s salvation is not about what man can withstand through his own power and ability. It should not be surprising that trusting in Christ’s shed blood is sufficiently efficacious during the most dreadful time since man’s creation. Salvation is by the blood! Revelation 19:10 And I fell at his feet to worship him. And he said unto me, See thou do it not: I am thy fellowservant, and of thy brethren that have the testimony of Jesus: worship God: for the testimony of Jesus is the spirit of prophecy. The brethren, like John, are those who have trusted in Jesus Christ for salvation. They are said to have the testimony of Jesus! This simply means that the brethren are believers in Christ. These believers are also repeatedly referred to as “the saints” like here in Revelation chapter 13. Only the believers are called fellowservants, the brethren and the saints during the Tribulation. The Bible always distinguishes between the saved and the lost even if only in the context. For instance, the context defines the two groups: the saved remnant (Revelation 11:13; Revelation 12:17) and the lost remnant (Revelation 19:21). The passage from Revelation chapter 13 above also seemingly makes another point concerning the believers’ self-defense during the Tribulation. It is not preppers or the most experienced survivalists that stand the best chance of enduring during the Tribulation. In fact, Revelation seems to teach a type of passive martyrdom. Addressing the saints, the Bible says that he that “killeth with the sword must be killed with the sword.” The patience and the faith of the saints seems to indicate that armed resistance or any type of a believer’s militia might be prohibited. Again, believers during this period are blessed to die “the death” while God supernaturally intervenes in unimaginable ways to offer resilience. The point is that self-defense could be prohibited. Revelation 14:12 Here is the patience of the saints: here are they that keep the commandments of God, and the faith of Jesus. 13 And I heard a voice from heaven saying unto me, Write, Blessed are the dead which die in the Lord from henceforth: Yea, saith the Spirit, that they may rest from their labours; and their works do follow them. Interestingly, Revelation also mentions that the saints that “die in the Lord” are blessed so the question must be asked and answered how a person gets “in the Lord.” Today, a person must make a conscious decision to believe “in the Lord” (Acts 9:42) and the Bible says that he is part of the brethren “in the Lord” (Philippians 1:14) and fellowservants “in the Lord” (Colossians 4:7). It seems obvious that an individual in the Tribulation will need to make a conscious decision to become a saint. It is frequently quite counterproductive to approach the Bible with rigid preconceived notions, especially concerning issues yet unsettled amongst most believers. In such cases, one’s mindset rather than the Bible becomes the determining factor in what is “truth.” A good example of this concerns the Bible’s reference to those that “keep the commandments of God.” Some view this phrase as referencing the need to keep God’s commandments during the Tribulation in order to assure salvation, but the truth is much simpler than that. The phrase concerning keeping the commandments of God is found in the New Testament thirteen times—half of which occur in the book of First John. The Bible offers several unambiguous reasons for keeping God’s commandments and NONE involves getting saved or remaining saved. Briefly, those who keep the commandments of God exhibit the testimony that they are the fellowservants, the brethren and the saints. A brief explanation is in order since this issue is so hotly contested among believers on both sides of the spiritual chasm. How does a person know that he knows Jesus Christ? By doing what Christ says to do. 1 John 2:3 And hereby we do know that we know him, if we keep his commandments. 4 He that saith, I know him, and keepeth not his commandments, is a liar, and the truth is not in him. According to this passage, keeping the commandments saves no one, but offers a clear assurance that one knows God. This is why disobedient Christians often struggle with a true assurance of salvation. Those who most doubt their salvation are those who do not do what God says to do. A person does not keep the commandments to be saved but does so in order to get his prayers answered. 1 John 3:22 And whatsoever we ask, we receive of him, because we keep his commandments, and do those things that are pleasing in his sight. 23 And this is his commandment, That we should believe on the name of his Son Jesus Christ, and love one another, as he gave us commandment. 24 And he that keepeth his commandments dwelleth in him, and he in him. And hereby we know that he abideth in us, by the Spirit which he hath given us. Verse 23 defines “his commandment”—believe on Christ and love one another. Verse 24 says that the Spirit of God given to believers testifies that Christ dwells within them (Romans 8:16). The Spirit bears witness so long as one does not grieve or quench the Spirit (Ephesians 4:30; 1 Thessalonians 5:19). Verse one defines how a person is born of God: NOT by keeping the commandments, but by believing that Jesus is the Christ. The verse continues by stating that all those who love God also love their fellow believers. 1 John 5:1 Whosoever believeth that Jesus is the Christ is born of God: and every one that loveth him that begat loveth him also that is begotten of him. 2 By this we know that we love the children of God, when we love God, and keep his commandments. 3 For this is the love of God, that we keep his commandments: and his commandments are not grievous. 4 For whatsoever is born of God overcometh the world: and this is the victory that overcometh the world, even our faith. 5 Who is he that overcometh the world, but he that believeth that Jesus is the Son of God? Verse two states that believers can know that they love other believers when they choose to love God and keep the commandments of God. Those who do not love their fellow brethren do not love God. Verse three defines the love of God as keeping His commandments. The disobedient simply do not love God and do not sufficiently love others. Verse three concludes by stating that the commandments are NOT grievous, but they certainly would be grievous if keeping the commandments was a reference to the 613 Old Testament commandments. Keeping the commandments would certainly be grievous if a failure to fulfill all of God’s commandments brought a loss of salvation. Simply put, keeping the commandments attests to one’s relationship with God; it is not the means by which that relationship is attained. Simply put, salvation is all about Jesus! The tribulation saints (the brethren and the elect) have trusted Jesus Christ and at no point will their salvation be dependent upon themselves (but there is more proof to follow). The brethren in the Tribulation are the believers in Jesus Christ; this is also referred to as the “faith of Jesus” (Revelation 14:12). The whole point of keeping the commandments concerns an outward display (testimony) that someone loves God. Nowhere does the Bible say that keeping the commandments earns someone a place in Heaven. Simple truth: if you love God, you keep the sayings (commandments) of God. Doing what God says to do testifies to one’s love toward the God he knows. The contrast concerns those who see the manifestation of God which the world cannot see. The manifestation of God only happens for those who love God. Revelation points out those who are going to be persecuted by Satan. The persecuted (the remnant of the woman—Israel) have the testimony that they “keep the commandments of God, and have the testimony of Jesus Christ.” Their testimony is that they do what God tells them to do. No one is keeping the commandments to earn salvation. The testimony of the saints during the Tribulation is clear: they keep the commandments of God. Nothing in the context indicates that anyone keeps God’s commandments for salvation. This point is reiterated two chapters later in Revelation. The Tribulation saints live by “the faith of Jesus” Christ (Galatians 2:20). The saints are not Jews that have rejected Jesus Christ, but spiritual brethren. They are saved by putting faith in the blood shed on the cross of Calvary. The preaching during the Church Age concerning what will happen after the Rapture will either promote or hinder the truth; it will either help those here in Daniel’s Seventieth Week or condemn them with a false teaching. If we preach salvation by faith and works and salvation is not by faith and works, our teachings become instruments of deception. Surely, our teaching will outlast us and if we get it wrong, it may be one of the tools of deception. Again, two chapters later the believers are referred to as saints. Revelation 16:6 For they have shed the blood of saints and prophets, and thou hast given them blood to drink; for they are worthy. Surely, someone must make a conscious decision to become a saint. The saints and prophets will be persecuted and killed by those who take the Mark and worship the image of the Beast. During the first half of Daniel’s Seventieth Week, while Michael remains upon the earth, he serves as Israel’s protector. At the midpoint (Revelation chapter 12), God summons Michael to Heaven in order to cast Satan to earth (Revelation 12:7-9). With Michael in Heaven, he is no longer on the earth to protect Israel. When Satan is cast down to earth, he goes into the Temple of God and desecrates it (2 Thessalonians 2:4) and Israel is told to flee at the abomination of desolation (Matthew 24:15-18). Interestingly, the saints that were slain for the word of God and the testimony (of Jesus) during the Tribulation are seen in Heaven. They want to know when God’s vengeance will be poured out upon their executioners. These Tribulation saints are told to wait until their fellowservants and brethren are also killed and then God will take out His vengeance upon the unbelievers on earth. He does not tell these murdered saints to wait until the Rapture (it has already happened years earlier); the Lord says wait until their fellow-brethren (the other believers) are killed. The brethren are waiting for Jesus Christ to come back to gather together the elect or waiting until their brethren on earth are caught and killed. VII. CAN A TRIBULATION BELIEVER TAKE THE MARK? During the Church Age, there is nothing that a believer can do to lose his salvation—making him eternally secure once he calls upon the name of the Lord to be saved (Romans 10:13). Are the Tribulation saints afforded any assurances of salvation? Yes, of course! Fortunately for the Tribulation saint, his soul’s salvation is dependent upon God and his relationship to Him, not upon his ability to withstand temptation or withstand the mass deception. One of the defining characteristics of those who can take the Mark is the fact that they were deceived into doing so (Point I). The deceived are the ones who receive the Mark of the Beast and they take the Mark because “he deceived them that had received the mark of the beast” (Revelation 19:20). This is a plain, simple and important feature! Yet, the saints/the brethren/the fellowservants cannot be deceived and thus cannot take the Mark. It is important to note that Matthew only refers to the believers as the “elect.” Unlike the book of Revelation, Matthew does not call the believers saints, brethren or fellowservants. Matthew calls believing Jews the elect (and the elect become the elect at salvation when elected). Here are a few times Matthew refers to the believers. God shortens the days for the elect’s sake and upon His return, He gathers together His elect. Before Christ returns to earth with His armies, He will send His angels before Him to gather together the elect—these are the saints, the brethren, the fellowservants of Revelation. They are the elect of Matthew. Those not gathered by the angels (the non-elect, unbelievers) are destroyed at His Second Coming. The elect are supernaturally protected by God. Fortunately, because of this supernatural protection, the elect cannot be deceived. The supernatural protection is not protecting them from death but only the opportunity for Satan to deceive them. This means that God will not allow them to be deceived and only the deceived take the Mark of the Beast. Matthew 24:23 Then if any man shall say unto you, Lo, here is Christ, or there; believe it not. 24 For there shall arise false Christs, and false prophets, and shall shew great signs and wonders; insomuch that, if it were possible, they shall deceive the very elect. The signs and wonders during Daniel’s Seventieth Week are so convincing that IF IT WERE POSSIBLE, these miracles would “deceive the very elect,” indicating that it is IMPOSSIBLE to deceive believers. Again, the elect are identified as the “saints” in Revelation with whom the Beast makes war (Revelation 13:7). Those who reject the truth will refuse to call on the name of the Lord to be saved (delivered). Those who call on the name of the Lord will then be supernaturally protected from deception because no mere human in his own strength without God’s supernatural intervention is capable of withstanding the deception. The elect/the saints/the brethren/the fellowservants cannot take the Mark. Those who trust Christ are protected and cannot be deceived. Deception brings damnation and God protects the elect from being deceived. VIII. HOW ARE THE SAVED SAVED? This subject has been hotly contested, but fortunately God has not left the Bible-believer without answers. Second Thessalonians chronology starts with the Rapture in verse 1, the midpoint of the seven years in verse 4 (the Abomination of Desolation), and the Second Coming in verse 8. As this chapter starts with the Rapture, it mentions the one event that precedes it (the apostasy of believers) and then the narrative covers the entire seven years. The events recorded in verses 10 through 12 have nothing to do with the Church Age or rejection of the gospel today (although many of us have either mis-taught this or been mis-taught). The one who comes after the working of Satan (the Beast) will come with all deceivableness of unrighteousness and deceive them that perish. Why do they perish? Because they received not the love of the truth (during Daniel’s Seventieth Week) THAT THEY MIGHT BE SAVED! Just let the Bible say what it says without forcing it to fit within a manmade dogma no matter how widespread the teaching. 2 Thessalonians 2:10 And with all deceivableness of unrighteousness in them that perish; because they received not the love of the truth, that they might be saved. 11 And for this cause God shall send them strong delusion, that they should believe a lie: 12 That they all might be damned who believed not the truth, but had pleasure in unrighteousness. The damned (those who perish) are identified as those who refused to believe the truth. They are deceived because they refused to be saved which is their ONLY protection from deception. These unbelievers refused the truth resulting in them refusing to call on the only one that could save them—Jesus Christ. The signs and wonders of the false Christ and false prophets are used to deceive but take note of the group that CANNOT be deceived (Matthew 24:24) and will not take the Mark or be damned from taking the Mark. How does an individual become one of the saints? Those present during Daniel’s Seventieth Week hear the gospel and must accept the truth to be saved. Truth rejectors NEVER get saved. The most important question of all … does the Bible definitively point out how someone gets saved? Yes, in Acts chapter 2. This chapter records Peter’s preaching with the context revealing that he is referencing the events of the Tribulation period—Israel’s last days, prophecy, visions, dreams, wonders, signs, etc, culminating in his mentioning the sun being turned dark and the moon into blood. How does someone get saved during Daniel’s Seventieth Week and delivered from the deception to come? He calls upon the name of the Lord and from that point forward, he has God’s promise of supernatural protection from deception. According to Matthew chapter 24, the believer cannot be deceived. The saints cannot take the Mark of the Beast because they cannot be deceived. When the saints are caught the “patience of the saints” will be their guide. Those delivered up to be judged by this world’s system are instructed not even to think about what they are going to say. They are to trust in the Lord. Whosoever shall call upon the name of the Lord is saved. Whosoever shall call upon the name of the Lord is a saint. Whosoever shall call upon the name of the Lord is one of the brethren. Whosoever shall call upon the name of the Lord is a fellowservant. The Devil persecutes the saints because their testimony is that they have trusted in the Lord and they are obedient followers of Him (they keep the commandments). Salvation in the Tribulation is Jesus, Jesus, Jesus! It is the blood. The Tribulation saint is saved by the blood, protected by the blood and delivered by the blood. Anything that detracts from Christ’s sacrifice on the cross is part of the deception. IX. WHAT INSTRUCTIONS ARE GIVEN TO A SAVED PERSON IF CAPTURED? Matthew chapter 24 records Christ’s Olivet Discourse as does Mark chapter 13. God not only supernaturally protects the saved from being deceived but He also protects all those captured by Satan’s minions. Some Bible teachers have pontificated that no one can withstand the temptation of watching loved ones decapitated—that is unless God shows Himself more powerful than the hordes of Hell. Those who call on the name of the Lord are saved (delivered) but this likely indicates much more than a mere physical salvation since believers can still be delivered up to those trying to compel them to take the Mark. Fortunately for the saved, if they lose their lives, these saints are still saved and are likely among the ranks of those martyred for the faith of Jesus (Revelation 20:4). Every preacher should desire for part of his enduring legacy to be that he loved the truth enough to admit when he has taught something wrong. His legacy should be that he loved souls enough to fix any teaching where he has erred even if he will be dead or gone before anyone knows the true ramifications of his teachings. That is what I want! Is that your desired legacy or is it more important whether you align yourself with your favorite teacher? It matters what the Bible teaches, not whether you agree with some other man. I have grown weary of being asked whether my teachings align with this man or that. Sheer carnality! I want to align with God and His book. We should allow the Bible to correct our errors and the fear of man has always been one of Satan’s greatest tools. Here is one more problem text from Mark chapter 13. Mark 13:13 And ye shall be hated of all men for my name's sake: but he that shall endure unto the end, the same shall be saved. Those who ENDURE UNTO THE END are physically saved to enter the millennium with natural bodies. Enduring to the end simply means that they made it to the end of the seven years without taking the Mark and without being caught and killed. When Christ sends His angels before Him to gather the elect (Matthew 24:31), it is this enduring group (along with some of the nations) delivered at Christ’s return to go into the millennium. The Tribulation saint is promised a supernatural salvation, as well as supernatural protection from damnation. Although some teach that a person is saved by faith and works in the Tribulation (which is what I was taught), there is no indication that a man’s works are salvific. If people are taught that their works are an element in salvation and this turns out to be wrong, trusting in one’s faith PLUS WORKS will condemn the individual for trusting in a false gospel and a false hope (Revelation 14:6). However, IF during the Tribulation people are saved by faith PLUS WORKS as some proclaim, then condemnation would come to those in the Tribulation who call on the name of the Lord and trust solely in Christ’s shed blood for salvation (Acts 2:21; Revelation 12:11). However, the point of this writing is to show that this hypothesis is false and dangerous because it is unbiblical. Unfortunately, one error leads to another. There are some preachers today who are teaching that the great deception during the Tribulation will be that preachers will be teaching that a person is saved by grace through faith without works during the Tribulation. As all error, one erroneous teaching frequently leads to some of the most egregious of errors. Salvation has always been and always will be by trusting in God’s revealed truth. Salvation is by grace because no one deserves salvation. Salvation is by grace because no one can earn salvation. Salvation is by grace through faith otherwise an individual could boast for the part he plays in his soul’s redemption. Salvation of the soul is always the unmerited favor of God. Praise God He opened my eyes to this truth and I have repented of having taught this wrong. Once a person in the Tribulation calls on the name of the Lord (Acts 2:21), he becomes a part of the elect (Mark 13:27), the brethren (Revelation 6:11), and the saints (Revelation 13:7). Through God’s grace and supernatural protection, the Tribulation saint cannot be deceived, thus he cannot take the Mark of the Beast (Revelation 14:11). Additionally, if the believer is caught by the authorities, he has no worries because God will put the very words he needs into his mouth (Mark 13:11). God receives all the glory and He has this whole thing figured out. I only wish I could say I always taught this truth this way. I did not and I was wrong! God help me to be a loud enough voice to undo the effects of having taught this wrong. Those present during the Tribulation need to have their eyes upon Jesus because nothing else suffices; nothing else saves! Salvation today is by the blood; salvation in the Tribulation is by the blood; nothing else saves! Interestingly, those who speak against the words of the captured Tribulation saint will in effect be blaspheming the Holy Ghost and these lost people will not be forgiven for that. Luke 12:10 And whosoever shall speak a word against the Son of man, it shall be forgiven him: but unto him that blasphemeth against the Holy Ghost it shall not be forgiven. 11 And when they bring you unto the synagogues, and unto magistrates, and powers, take ye no thought how or what thing ye shall answer, or what ye shall say: 12 For the Holy Ghost shall teach you in the same hour what ye ought to say. God has a purpose for everything, even the capture of those who have trusted in Him during Daniel’s Seventieth Week. The Holy Ghost will give these believers the words to say; their captors trying to compel them to take the Mark will think they are speaking against the individual, but their words will be actually blaspheming God, the Holy Ghost (who is speaking through these saints). God has a purpose for everything, and everything has a purpose. God gets the glory no matter what happens but certainly not if man plays a part in the salvation of his soul. I appreciate your balanced approach too. This subject is controversial and some have made it the dividing line for fellowship. It need not be. My position is clear; I simply want the truth and no matter the cost, it is worth the price. My prayer is that this subject (the truth) can be unifying and not so divisive (but so be it because Christ is worth it all). I am also passionate about it because I do believe our teaching will either save or condemn those who listen after we are gone. Stay on the front lines brother! Thank you Chris...yes, much to think about. The position I have taken has taken me 20 years and still working on it. However, I firmly believe what I have written is correct and I hope it is a blessing to you and others.